Hi! Welcome to Save Winter! This site helps raise money for Winter the Dolphin. We support CMA and their residents and their mission to rescue, rehab, and release Winter is inspiring! She is the star of the movie, Dolphin Tale, starring Harry Connick Jr., Kris Kristofferson, Ashley Judd, Nathan Gamble, Cozi Zuehlsdorff and Morgan Freeman. I have interviewed Cozi Zuehsldorff, Austin Highsmith, Betsy Landin, Michael Roark (who were all in Dolphin Tale), Dr. Juli Goldstein who helped rescue Winter, and even some of Winter's former trainers, Cynthia Lee and Elaina Franklin! Winter lost her tail after getting it caught in a crab trap. She was left with just a stub. She now has a prosthetic tail made out of silocone and plastic. 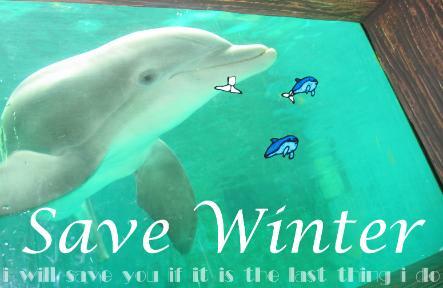 Winter is the most amazing dolphin in the world. Please help us help Winter by donating or buying something by either going to our "store" page or clicking HERE. Enjoy! Here are some of my favorite websites that you might enjoy as well! Please check them all out! www.seewinter.com The OFFICAL Clearwater Marine Aquarium Website! http://dolphintalemovie.warnerbros.com/dvd/index.html The OFFICAL Dolphin Tale Website! 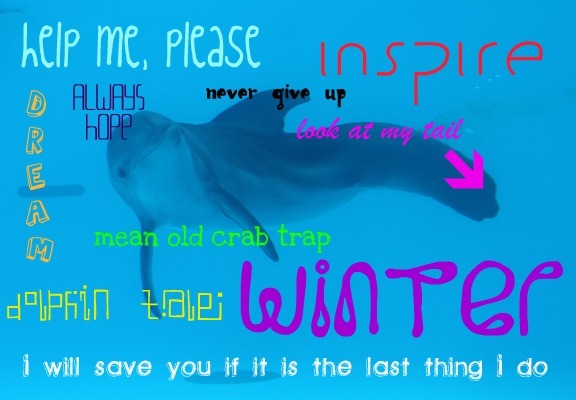 http://www.wintersfamily.webs.com/ A website that you love if you love Dolphin Tale! http://www.drjuli.com/ A website made by Dr. Juli who helped rescue Winter and Hope! http://www.cynthialee.org/ A website made by Cynthia Lee, one of Winter's former trainers! https://www.facebook.com/positivesolutionstraining Facebook Page for "Positive Solutions Animal Training" owned by Elaina, one of Winter's former trainers! http://thewinterdolphinchronicles.wordpress.com/ A Blog by an Aquarium Intern, Jenna! You can find this app by searching "Wild Dolphins" in the Apple App Store! It has a feature on Winter! **Please Note: this app is only for ipad!